Container view controllers are a way to combine the content from multiple view controllers into a single user interface. Container view controllers are most often used to facilitate navigation and to create new user interface types based on existing content. Examples of container view controllers in UIKit include UINavigationController, UITabBarController, and UISplitViewController, all of which facilitate navigation between different parts of your user interface. In almost every way, a container view controller is like any other content view controller in that it manages a root view and some content. The difference is that a container view controller gets part of its content from other view controllers. The content it gets is limited to the other view controllers’ views, which it embeds inside its own view hierarchy. The container view controller sets the size and position of any embedded views, but the original view controllers still manage the content inside those views. What is the role of the container and what role do its children play? How many children are displayed simultaneously? What is the relationship (if any) between sibling view controllers? How are child view controllers added to or removed from the container? Can the size or position of the children change? Under what conditions do those changes occur? Does the container provide any decorative or navigation-related views of its own? What kind of communication is required between the container and its children? Does the container need to report specific events to its children other than the standard ones defined by the UIViewController class? Can the appearance of the container be configured in different ways? If so, how? The implementation of a container view controller is relatively straightforward after you have defined the roles of the various objects. The only requirement from UIKit is that you establish a formal parent-child relationship between the container view controller and any child view controllers. The parent-child relationship ensures that the children receive any relevant system messages. Apart from that, most of the real work happens during the layout and management of the contained views, which is different for each container. You can place views anywhere in your container’s content area and size those views however you want. You can also add custom views to the view hierarchy to provide decoration or to aid in navigation. A UINavigationController object supports navigation through a hierarchical data set. A navigation interface presents one child view controller at a time. A navigation bar at the top of the interface displays the current position in the data hierarchy and displays a back button to move back one level. Navigation down into the data hierarchy is left to the child view controller and can involve the use of tables or buttons. Navigation between view controllers is managed jointly by the navigation controller and its children. When the user interacts with a button or table row of a child view controller, the child asks the navigation controller to push a new view controller into view. The child handles the configuration of the new view controller’s contents, but the navigation controller manages the transition animations. The navigation controller also manages the navigation bar, which displays a back button for dismissing the topmost view controller. Figure 5-1 shows the structure of a navigation controller and its views. Most of the content area is filled by the topmost child view controller and only a small portion is occupied by the navigation bar. In both compact and regular environments, a navigation controller displays only one child view controller at a time. The navigation controller resizes its child to fit the available space. A UISplitViewController object displays the content of two view controllers in a master-detail arrangement. In this arrangement, the content of one view controller (the master) determines what details are displayed by the other view controller. The visibility of the two view controllers is configurable but is also governed by the current environment. In a regularly horizontal environment, the split view controller can show both child view controllers side-by-side or it can hide the master and display it as needed. In a compact environment, the split view controller displays only one view controller at a time. Figure 5-2 shows the structure of a split view interface and its views in a regularly horizontal environment. The split view controller itself has only its container view by default. In this example, the two child views are displayed side-by-side. The size of the child views is configurable, as is the visibility of the master view. 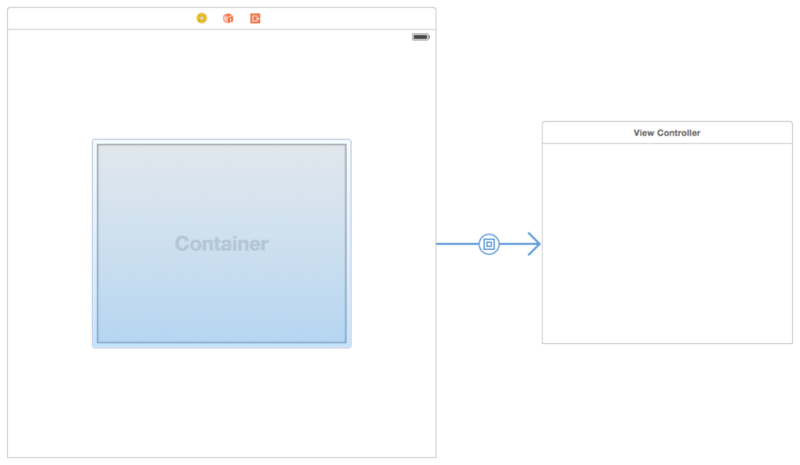 To create a parent-child container relationship at design time, add a container view object to your storyboard scene, as shown in Figure 5-3. A container view object is a placeholder object that represents the contents of a child view controller. Use that view to size and position the child’s root view in relation to the other views in the container. When you load a view controller with one or more container views, Interface Builder also loads the child view controllers associated with those views. The children must be instantiated at the same time as the parent so that the appropriate parent-child relationships can be created. If you do not use Interface Builder to set up your parent-child container relationships, you must create those relationships programmatically by adding each child to the container view controller, as described in Adding a Child View Controller to Your Content. To implement a container view controller, you must establish relationships between your view controller and its child view controllers. Establishing these parent-child relationships is required before you try to manage the views of any child view controllers. Doing so lets UIKit know that your view controller is managing the size and position of the children. You can create these relationships in Interface Builder or create them programmatically. When creating parent-child relationships programmatically, you explicitly add and remove child view controllers as part of your view controller setup. Call the addChildViewController: method of your container view controller. This method tells UIKit that your container view controller is now managing the view of the child view controller. Add the child’s root view to your container’s view hierarchy. Always remember to set the size and position of the child’s frame as part of this process. Add any constraints for managing the size and position of the child’s root view. Call the didMoveToParentViewController: method of the child view controller. Listing 5-1 shows how a container embeds a child view controller in its container. After establishing the parent-child relationship, the container sets the frame of its child and adds the child’s view to its own view hierarchy. Setting the frame size of the child’s view is important and ensures that the view shows up correctly in your container. After adding the view, the container calls the child’s didMoveToParentViewController: method to give the child view controller a chance to respond to the change in view ownership. In the preceding example, notice that you call only the didMoveToParentViewController: method of the child. That is because the addChildViewController: method calls the child’s willMoveToParentViewController: method for you. The reason that you must call the didMoveToParentViewController: method yourself is that the method cannot be called until after you embed the child’s view into your container’s view hierarchy. When using Auto Layout, set up constraints between the container and child after adding the child to the container’s view hierarchy. Your constraints should affect the size and position of only the child’s root view. Do not alter the contents of the root view or any other views in the child’s view hierarchy. Call the child’s willMoveToParentViewController: method with the value nil. Remove any constraints that you configured with the child’s root view. Remove the child’s root view from your container’s view hierarchy. Call the child’s removeFromParentViewController method to finalize the end of the parent-child relationship. Removing a child view controller permanently severs the relationship between parent and child. Remove a child view controller only when you no longer need to refer to it. For example, a navigation controller does not remove its current child view controllers when a new one is pushed onto the navigation stack. It removes them only when they are popped off the stack. Listing 5-2 shows you how to remove a child view controller from its container. Calling the willMoveToParentViewController: method with the value nil gives the child view controller an opportunity to prepare for the change. The removeFromParentViewController method also calls the child’s didMoveToParentViewController: method, passing that method a value of nil. Setting the parent view controller to nil finalizes the removal of the child’s view from your container. When you want to animate the replacement of one child view controller with another, incorporate the addition and removal of the child view controllers into the transition animation process. Before the animations, make sure both child view controllers are part of your content but let the current child know that it is about to go away. During your animations, move the new child’s view into position and remove the old child’s view. At the completion of the animation, complete the removal of the child view controller. Listing 5-3 shows an example of how to swap one child view controller for another using a transition animation. In this example, the new view controller is animated to the rectangle currently occupied by the existing child view controller, which is moved offscreen. After the animations finish, the completion block removes the child view controller from the container. In this example, the transitionFromViewController:toViewController:duration:options:animations:completion: method automatically updates the container’s view hierarchy, so you do not need to add and remove the views yourself. // Prepare the two view controllers for the change. // for the old view controller. Both rectangles are offscreen. // Queue up the transition animation. // Animate the views to their final positions. // notification to the new view controller. After adding a child to a container, the container automatically forwards appearance-related messages to the child. This is normally the behavior you want, because it ensures that all events are properly sent. However, sometimes the default behavior may send those events in an order that doesn’t make sense for your container. For example, if multiple children are simultaneously changing their view state, you may want to consolidate the changes so that the appearance callbacks all happen at the same time in a more logical order. To take over responsibility for appearance callbacks, override the shouldAutomaticallyForwardAppearanceMethods method in your container view controller and return NOfalse, as shown in Listing 5-4. Returning NOfalse lets UIKit know that your container view controller notifies its children of changes in its appearance. When an appearance transition occurs, call the child’s beginAppearanceTransition:animated: or endAppearanceTransition method as appropriate. For example, if your container has a single child referenced by a child property, your container would forward these messages to the child as shown in Listing 5-5. Access only the root view of a child view controller. A container should access only the root view of each child—that is, the view returned by the child’s view property. It should never access any of the child’s other views. Child view controllers should have minimal knowledge of their container. A child view controller should focus on its own content. If the container allows its behavior to be influenced by a child, it should use the delegation design pattern to manage those interactions. Design your container using regular views first. Using regular views (instead of the views from child view controllers) gives you an opportunity to test layout constraints and animated transitions in a simplified environment. When the regular views work as expected, swap them out for the views of your child view controllers. Let a child view controller determine the status bar style. To delegate the status bar appearance to a child, override one or both of the childViewControllerForStatusBarStyle and childViewControllerForStatusBarHidden methods in your container view controller. Let the child specify its own preferred size. A container with a flexible layout can use the child’s own preferredContentSize property to help determine the size of the child.